If you’ve never had an outdoor shower you’ve missed quite the treat. There’s nothing quite like the warm setting sun glancing off the water drops, the sounds of the crickets and peepers putting on an auditory show while you bathe, the softest of wind brushing your cheek while the wind chimes sing a lovely melody. Here on Nemeton outdoor showers were our only option for the first 2 years. Warm months only of course, here in NY that’s somewhere around April till about October, depending on how you define warm, and how badly you’d like a hot shower… I had been gifted, from my dear friend Tom, an outdoor on-demand hot water heater fueled by propane. 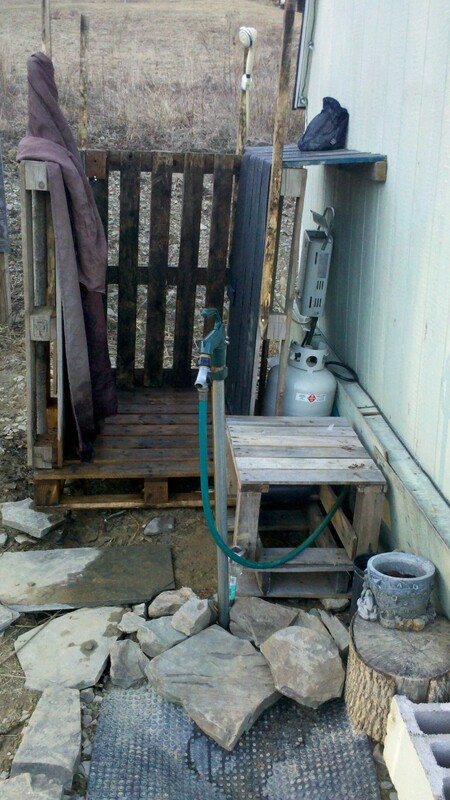 So I rigged an outdoor shower stall out of oak pallets, a few screws and a tapestry or two. Making the floor and 3 walls, took just a few minutes, digging the ‘drain’ out for underneath the stall took a little more time as we have very dense clay here. The location we chose had the shower in full sun, from about 11am – 5pm, it also gave us privacy and wind protection. I didn’t want water hitting the heater itself so I covered that part of the wall with some sheets of donated rubber roofing, in overlapping strips with staples to tack down. The water supply runs from the outdoor spigot to the heater where the electric battery supplied igniter lights the pilot and heats the water when it senses a certain water pressure. The drainage/runoff from the showers goes through the shower floor and into a drain ditch that has been filled with fine stone/gravel and charcoal, once the water runs through the ditch it ends up in the flower garden. And as we only shower with natural soaps & scrubs that we make here, the plants love it!! The beauty of natural irrigation and the multi-purpose use of water. This little powerhouse of a heater can heat water to scalding temperatures and maintain them for as long as desired, without major fluctuations! The trick behind this, is to keep all water lines as short as possible both going from the water supply to the heater and from the heater to the shower head. Durability wise, what can i say, 2 years later, daily use and it’s still going strong! Fuel usage wise, I’d say we use about a 20lb (about $10) tank of propane a month. Looks pretty comfy in the photograph… but I imagine it would be a little chilly to use today! Thanks for the follow, and I’m now following back.